If you're like me, you dread thinking about retirement planning. But a new website from two nonprofit organizations, AARP and the Ad Council, incorporates a "digital retirement coach" that helps you get started with minimal pain. That's saying a lot. According to a survey commissioned by AARP and Ad Council, 45 percent of moderate-income Americans between 40 and 59 years old said they would prefer a visit to the dentist to a meeting with a financial adviser. The same survey found that 49 percent of people in that age group were not confident about retirement planning. To be sure, there are plenty of obstacles to retirement saving, including tight budgets and lack of financial confidence. Yet most of the 40- to 59-year-olds surveyed have already met significant financial challenges in their lives, including buying a car or a house, or paying off a student loan or mortgage. More than half have used money-saving strategies like coupon-clipping and comparison shopping. With that data in mind, AARP and the Ad Council created AceYourRetirement.org, a free website that takes a lot of complexity and stress out of retirement saving. 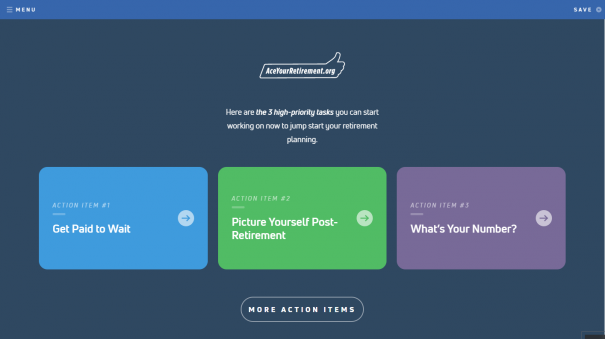 That's also where you'll meet a chatbot named Avo, the site's digital retirement coach. But why a chatbot? "People already feel overwhelmed or stressed when they think about their retirement savings," says Mary Liz Burns, the Strategy Director of Financial Resilience at AARP, "and we wanted to create an empowering experience to help people get on track — they can do this! 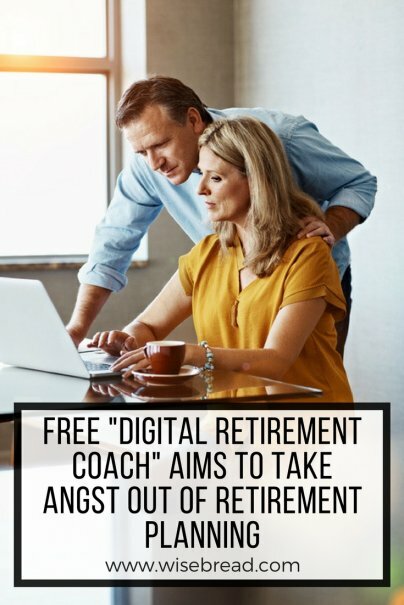 AceYourRetirement.org and our friendly digital coach, Avo are fun and accessible for everyone, and there is no judgement. As you use the site, you feel like you are simply texting with a friend." Here's what I found when I visited. Here's a screenshot of my visit. It looks more like the interface on a smartphone chat or texting app than an accounting tool. There are no form fields to fill with personally identifiable information, or spreadsheets to download and save. There are no ads pitching retirement saving products (it was created by nonprofits, after all). After you click through a few introductory screens, a smiling chatbot named Avo blinks at you and begins to ask questions. Avo is a "digital retirement coach" that makes the whole process feel friendly and supportive. You answer its questions by typing a few words in the chat window or by selecting "yes" or "no" with a slider button. Avo asks your age, when you plan to retire, whether you plan to work part-time once you do, and if you have kids. Only one question is tough — the percentage of income you're already setting aside for retirement, so you may want to get a handle on that before you start. After half a dozen or so similar questions, it returns with some advice. The questionnaire was much shorter than I expected it to be. 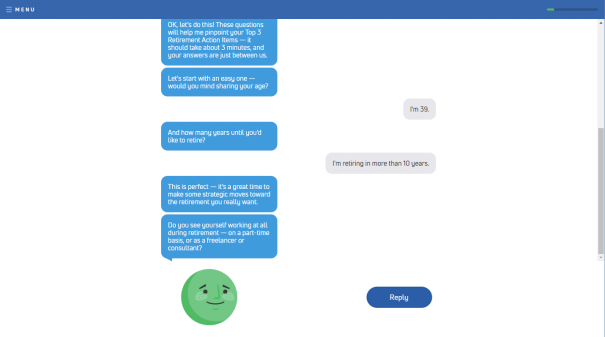 With the action items, the website drops the chatbot and gets down to brass tacks. "Get paid to wait" advised me to delay taking Social Security to maximize my monthly payment. It also pointed me to additional tools where I can learn my full retirement age (according to the Social Security Administration), and how much I can expect to receive once I do take Social Security. Reading this is a little more involved than answering a chatbot's questions, but honestly, it still takes only 20 minutes max. The other two action items were more detailed and required more time — and financial details — before I could check them off my to-do list. Digging in on the other two action items meant reviewing my current savings and expenses to estimate my post-retirement needs and calculating how much I need to save to get there. These are the familiar calculations one finds at retirement planning websites across the internet. Presented here as a series of step-by-step tasks, the road ahead seems a little less daunting. That's not to say the required amount that I need to save isn't daunting — it is! — but with the website's help, at least I have a number to aim for. With the savings goal in hand, I have an idea of the scope of the challenge ahead, but I still have a lot of work to do. I need to increase my savings to reach that number, and there is more to that than answering questions in chat and filling in calculator fields. I need to choose the right savings vehicles, prioritize some spending, and eliminate credit card debt once and for all. The resources included in the action items offer additional detail on how to accomplish some of these important tasks. It's still a lot of work, but at least with the provided guidance I'm more confident now that I know where to start. Will Avo be a financial adviser in the future? There is a lot of chatter in personal finance circles about using behavioral "nudges" to help people become better at money management, including retirement planning. Popular personal finance apps like Mint and Personal Capital make the task easier by eliminating a lot of the tedium through automation, and they make it more fun with user-friendly interfaces. Elsewhere, financial experts often encourage us to automate saving through direct deposit from our paychecks, and there's been a shift toward making 401(k) deductions "opt-out" rather than "opt-in." When the deductions are done by default, we're much more likely to take advantage of them. Right now, Avo does a great job helping reluctant savers get over early resistance to retirement planning. Maybe one day, Avo will work in tandem with a financial robo-adviser tied to our investment accounts to give us with more in-depth financial planning. For now, give Avo a try and see if you don't feel more confident about retirement planning, too.